This piece of action research explores the experiences of social science tutors in communicating their identity in online environments for the benefit of role satisfaction and student learning experience. Data gathered via an online questionnaire was analysed using elements of Appreciative Enquiry. Findings highlighted the challenges of maintaining a student-centred identity in online environments. Issues of physicality, presence and being seen as a person were raised during the study. 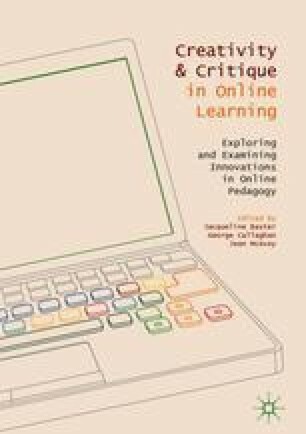 The authors hope that the ideas discussed will support communication of identity online and thus support role satisfaction in a pedagogical environment using increasing levels of online delivery. The chapter concludes that further research is required with an enhanced appreciative focus, in order to elicit a body of evidence on elements of good practice. Appreciative Inquiry Commons. (n.d.). What is appreciative inquiry? [Online]. Available at https://appreciativeinquiry.case.edu/intro/whatisai.cfm. Accessed 21 Nov 2016. Baxter, J. (2012). The impact of professional learning on the teaching identities of higher education lecturers. European Journal of Open, Distance and E Learrning 2012: II [Online]. http://www.eurodl.org/index.php?p=archives&year=2012&halfyear=2&article=527. Accessed 23 Mar 2017.